core-periphery relations in the spatial pattern of creative economy, especially cince the recent financial crisis. The relative weight of Budapest and its urban region has been continuously growing and even major regional centres are unable to keep pace with the Hungarian capital. We also found that cities in the Hungarian urban system became highly differentiated according to their attractiveness for creative firms and labour, and there is a growing competition among secondary cities for knowledge based and creative activities. The growing geographical concentration of the creative economy (especially the knowledge intensive industries) is partly the result of previous neoliberal regional and urban policies. Baculáková, K. 2018. Cluster analysis of creative industries in the regions and districts of Slovakia. Theoretical and Empirical Researches in Urban Management 13. (3): 74–89. Caves, R. 2002. Creative industries: contrast between art and commerce. Cambridge–London, Harvard University Press. Christaller, W. 1933. Die zentralen Orte in Süddeutschland (Central places in Southern Germany). Jena, Gustav Fischer. Cunningham, S. 2002. From Cultural to Creative Industries: Theory, Industry, and Policy. Media International Australia Incorporating Culture and Policy: Quarterly Journal of Media Research and Resources 102. (1): 54–65. Egedy, T. and Kovács, Z. 2009. The capacity and potentials of Budapest to attract creative economy. 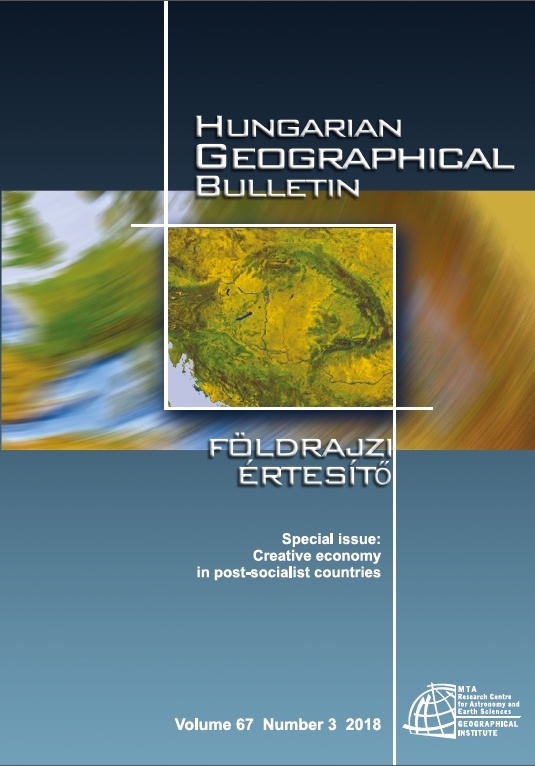 Hungarian Geographical Bulletin 58. (4): 281–294. Egedy, Z., Balogi, A., Földi, Zs. and Kovács, Z. 2008. Main drivers for settlement of creative and knowledge intensive companies in the Budapest Metropolitan Region – The managers' view. ACRE Report 6.4, Amsterdam, AMIDSt, University of Amsterdam. Florida, R. 2002. The Rise of the Creative Class: and How it is Transforming Work, Leisure, Community and Everyday Life. New York, Basic Books. Gáková, Z. and Dijkstra, L. 2014. Labour mobility between the regions of the EU–27 and a comparison with the USA. Regional Focus, Regional Policy. Brussels, European Commission. Hall, P. 1998. Cities in civilization: culture, innovation and urban order. London, Weidenfeld and Nicholson. Howkins, J. 2013. The Creative Economy: How Ppeople Make Money from Ideas. 3rd edition, London, Penguin Books. Kao, J. 1996. Jamming: The Art and Discipline of Business Creativity. New York, Harper Collins. Kovács, Z., Egedy, T., Földi, Zs., Keresztély, K. and Szabó, B. 2007. Budapest: From state socialism to global capitalism – Pathways to creative and knowledge–based regions. ACRE Report 2.4, Amsterdam, AMIDSt, University of Amsterdam. Kovács, Z., Pethe, H. and Miosga, M. 2010. Policies for firms or Policies for Individuals? Amsterdam, Munich and Budapest. In Making Competitive Cities. Eds: Musterd, S. and Murie, A., Oxford, Wiley, 286–305. Kozina, K. and Bole, D. 2018. The impact of territorial policies on the distribution of the creative economy: tracking spatial patternsof innovation in Slovenia. Hungarian Geographical Bulletin 67. (3): 259–273. Landry, C. 2000. The creative city: A toolkit for urban innovators. London, Earthscan. Landry, C. and Bianchini, F. 1995. The creative city. London, Demos–Comedia. Lösch, 1940. Die räumliche Ordnung der Wirtschaft (The economics of location). Jena, Gustav Fischer. Martin-Brelot, H., Grossetti, M., Eckert, D., Gritsai, O. and Kovács, Z. 2009. Not so mobile 'creative class': a European perspective. Gawc Research Bulletin 306. 1–15. Murovec, N. and Kavaš, D. 2012a. Creative industries in Ljubljana urban region. Working paper No. 70. Ljubljana, Institute for Economic Research. Musterd, S. and Murie, A. (eds) 2010. Making Competitive Cities. Oxford, Wiley. Musterd, S., Bontje, M., Chapain, C., Kovács, Z. and Murie, A. 2007. Accomodating Creative Knowledge. A literature review from a European perspective. ACRE report 1. Amsterdam, AMIDSt, University of Amsterdam. Peck, J. 2005. Struggling with the creative class. International journal of Urban and Regional Resarch 29. (4): 740–770. Pintilii, R., Peptenatu, D., Ciobotaru, A-M., Toma, S-G., Grigore, A-M., Drăghici, C-C., Dobrea, R., Simion, A., Andronache, I., Teodorescu, C. and Diaconu, D. 2017. Creative economies in Romania – spatial projections and trends. Bulletin of Geography, Socio-economic Series 37. 95–108. Power, D. and Nielsen, T. 2010. Priority sector report: creative and cultural industries. The European cluster observatory. Stockholm, Centre for Strategy and Competitiveness at the Stockholm School of Economics. Pratt, A.C. 2011. The cultural contradictions of the creative city. City, Culture and Society 2. (3): 123–130. Ratalewska, M. 2016. The Development of Creative Industries in Poland Comparison with the European Union. In Entrepreneurship, Business and Economics, Vol. 1. Eds. : Bilgin, M. and Danis, H., Eurasian Studies in Business and Economics, Vol. 3/1. Cambridge, Springer. Ságvári, B. and Dessewffy, T. 2006. On creative economy – Europe and Hungary in the creative age. Budapest, DEMOS Hungary Foundation. Schuchmann, J. 2012. Suburbanisation processes in the Budapest metropolitan region. In Metropolitan Regions in Europe. Eds. : Szirmai, V. and Fassmann, H., Budapest, Hungarian Action Fund, 100–120. Slach, O., Koutský, J., Novotný, J. and Ženka, J. 2013. Creative industries in the Czech Republic: A spatial perspective. Ekonomie a Management 16. (4):14–29. Szirmai, V., Váradi, Zs., Kovács, Sz., Baranyai, N. and Schuchmann, J. 2011. Urban sprawl and its spatial, social consequences in the Budapest Metropolitan Region. In Urban Sprawl in Europe. Similarities or Differences? Ed. : Szirmai, V., Budapest, Aula Kiadó, 141–186. Thorsby, D. 2001. Economics and culture. Cambridge, Cambridge University Press. Törnqvist, G. 1983. Creativity and the renewal of regional life. In Creativity and context: A seminar report. Lund Studies in Geography B. Human Geography. Ed: Buttimer, A., Lund, Gleerup Buttimer, 91–112. UNCTAD 2008. Creative Economy Report – The challenge of assessing creative economy: towards informed policymaking. Geneva–New York, United Nations. (retrieved: 06.05.2018). Vitálišová, K., Vaňová, A. and Borsekova, K. 2013. The role of creative economy in Slovak Republic. AI & Society 30. (2): 271–281. Zipf, G.K. 1949. Human behavior and the principle of least effort. Cambridge, Addison Wesley.